Pressed By – Abbey Record Manufacturing Co., Inc. This is the original US stereo release. this was pressed by the Abbey Record Manufacturing Co. I like this album a lot, it's their most psychedelic album. Very underrated in my mind. There were quite a few psych bands on Mainstream, but I don't think any of them recorded more than one album for the label. 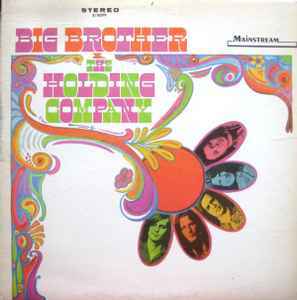 Anyway, Big Brother & the Holding Company was a perfect band for Janis and they only got better on their fantastic second album, Cheap Thrills, released of course on their new label, Columbia. They could have made other landmark psych/blues rock records like this with Janis, but unfortunately she let worthless bigwigs in the record business convince her that she needed a more "precise" band, a professional studio band. Bad decision. Though she did remain friends with Sam Andrew, the rawness and the passion in the music largely disappeared on her solo albums. Dumping Big Brother has got to be the worst thing she ever did short of overdosing. She probably knew she made a bad move and was torn between a solo deal worth more money, and her original band. I don't think there would have been a better reason than that for her to turn to heroin the way she did. Worth a listen for fans of Joplin or the psychedelic San Francisco sounds of acts like the Grateful Dead, Country Joe and The Fish or Jefferson Airplane but unfortunately at this point Big Brother aren't utilising Joplin as much as they could have, and there's some weak material here that hasn't aged well. The CD re-release contains some interesting bonus tracks, but this is maybe the least essential of her work.